1997 850R T5/manual. High miles (275,000), and it looks badly modded. $3,300 obo. 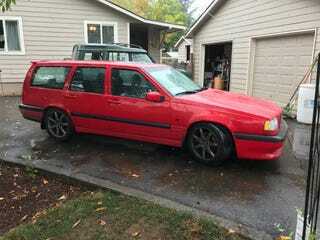 Pros: It’s red, it’s a wagon, it’s an “R” and it’s manual. Cons: practically everything else. The original steering wheel and airbag are gone, there are gauges screwed to the top of the dash, etc. How finnicky are these things electronically? Could I get a steering wheel/airbag/clockspring from the ‘yard and expect the system to regain functionality? I think I’ll just keep looking.